This is a beautiful perfume, bows & pearls top I got from Evans. It was only £7 in the sale, but with my discount I got it for £4.20! I adore this and have been eyeing it up for a long time. I thought I'd missed my chance to get it but when I saw it in the sale I dived on it! It is a size too big for me, but I don't think it really matters with something as floaty as this top. It's beautiful. I love it! I got this little set from George at Asda. 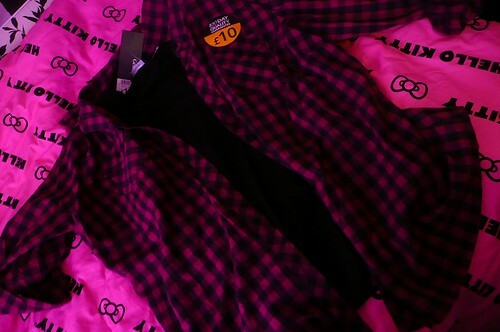 It's a black vest and a beautiful pink shirt. I doubt I'll wear the vest, but I adore the shirt. I've wanted one like this one for ages so when I saw it I grabbed it! Then, of course when I saw this I had to buy it. How could I say no to Hello Kitty? 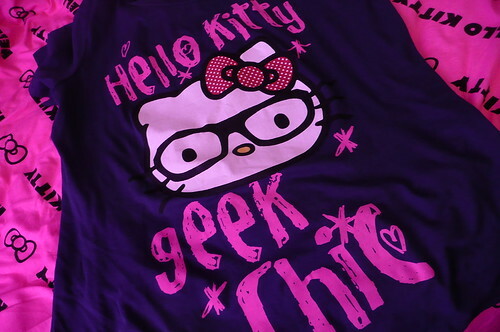 I adore the Hello Kitty Nerd branding! So what else is going on? Well, tomorrow I'm going with my dad to see the Le Mans Series at Silverstone. The only reason I'm going is to see Giancarlo Fisichella. I can't wait! I hope I get to meet him at the autograph session. I've been a fan of him for 12 years and I've never met him yet. Sniff! I'll be taking loads of photo, of course and I'll be uploading them when I get home.